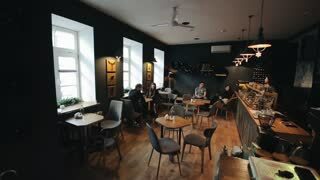 Search Results for "coffee shops"
Minsk, Belarus - 11 January 2019: Candid image of young couple in a coffee shop. Caucasian man and woman sitting with a dog in a cafe. Long shot of loft style coffee shops. Candid image of young couple in a coffee shop. Caucasian man and woman sitting with a dog in a cafe. Long shot of loft style coffee shops. A timelapse of Shoreditch in London. A young couple stroll through The Lanes in Brighton,UK past coffee shops and bars. When making a latte, you must have the steamed milk and custom coffee mug. What makes it more personal and pleasing than that? Pouring latte (milk) art. China is progressing fast in the world of speciality coffee shops! ADELAIDE, SOUTH AUSTRALIA - FEBRUARY 23, 2018: Action camera vehicle POV driving through Seaview Road Henley Beach shopping centre. Adelaide, South Australia - April 29, 2018: Action camera passenger POV driving along Rundle Street, Adelaide South Australia. Passenger POV driving along Rundle Street, Adelaide South Australia time lapse. 1950s - Two men who work graveyard shifts at a produce market take a break and go to a coffee shop. 1950s - Two men working a graveyard shift get coffee at a nearby shop. Promenade in Bol on the island Brac at summer night. Editorial use only!